The following post was contributed by Volume 76 of the Louisiana Law Review. If your law review is doing something cool to further your journal like the team at LLR, and you’d like to share it on our blog, please let us know! Lawyers are busy people. And to be good at their jobs, they need to be able to easily access and consume the latest legal information. The Louisiana Law Review created our podcast—The Legal Ease—with this in mind. For those new to podcasting, a podcast is a type of internet radio show that can be accessed at the convenience of the listener, and because all of our content is available on any smartphone, lawyers and students can listen to it while they drive, eat, or at any other convenient time. Not only that, podcasts are citable per The Bluebook, which gives the content of each episode academic and legal force. Making podcasts is cheap and easy. We started with under $800 in equipment that allows us to record phone and Skype calls, as well as quality in-studio interviews. We use Audacity, a free audio software, to edit each podcast episode, and our Online Editor learned everything that he needed to know to produce and edit the show from YouTube. Our goal is to produce one podcast episode per month, and each episode may contain multiple segments. A segment may be student-run or an interview with a professional. Getting busy people — like law review members — to take on considerably more work with a podcast can be challenging. Here is what worked for us. First, the Online Editor created titles and accompanying responsibilities for each title. This gave volunteers an extra line on their resume and allowed the volunteer podcast members to understand their new role. Second, we found that adopting an “eat what you kill” policy, where whoever pulled in a big name guest got to interview them, incentivized people to hunt down quality guests. Finally, we found people who were good behind a microphone and allowed them to appear in recurring segments so there was always content flowing into the show. Those who wanted to participate, but not necessarily be featured on the show, helped recruit interviewees, edit and brainstorm content, and schedule the recordings. The type and direction of content on the show is mainly driven by the volunteer segment hosts, those that contribute ideas at our regular meetings, and the Online Editor. We often try to incorporate a Louisiana focus in our segments because that best suits our market, but we also balance this by periodically featuring national topics. In essence, we want to be sure that all of our material is current, compelling, and practical to our listeners. So far, we have produced six episodes and have recently completed a two-part series with Judge James Dennis, former Chief Justice of the Louisiana Supreme Court and current judge on the Fifth Circuit Court of Appeals. We have also featured federal Judges Lee Rosenthal and Elizabeth Foote, in addition to numerous local practitioners and professors. The caliber of the guests who agreed to contribute to The Legal Ease has exceeded our expectations. Judges, practitioners, and professors have gladly contributed, because they can easily impart knowledge on a particular legal topic, and recording the podcast is a lot of fun. Also, because interviews can be done by phone, we can work around our guests’ busy schedules, and it is not a problem if our guest cannot do the interview in-studio. Expanding the Louisiana Law Review‘s online presence was a priority for this year’s Board of Editors, especially the Online Editor. Although we started with minimal equipment and experience, The Legal Ease has taken off and is a growing topic of conversation among Louisiana’s legal community. The Legal Ease is still in its infancy, but we look forward to being on the cutting-edge of disseminating legal information in an innovative way. Even though the Louisiana Law Review stays dedicated to its print publication, we recognize that the legal community consumes information in a different way today. Therefore, we strive to meet that need by providing easily accessible, relevant, and timely legal information through the vehicle of The Legal Ease. 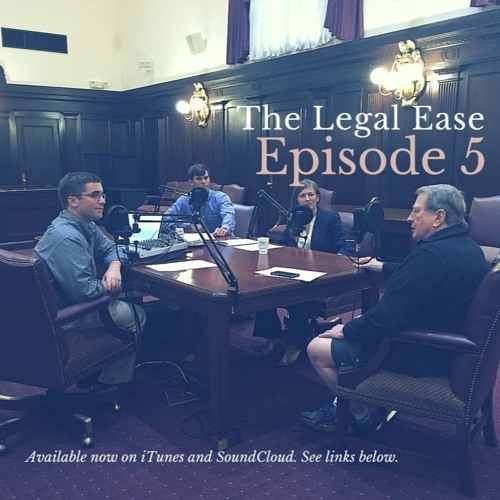 The Legal Ease is free to listeners on iTunes and SoundCloud. The podcast, along with notes and commentary on each episode, can be found on the Louisiana Law Review‘s website at https://lawreview.law.lsu.edu/podcast/. Houston Law Review's editor in chief shares how they are using Scholastica publishing tools and services to make their content more discoverable online and empower readers to explore the law review from all digital devices. Learn how and why Denver Law Review encourages scholarship by non-tenured legal scholars. In this post, we're sharing some submissions pro-tips that you can use to improve your chances of publication and save precious time. In this post we're highlighting some of the features law review authors love the most, so if you aren't yet familiar with them you can start reaping the benefits!